It was historian Arnold Toynbee's premise that if a nation or civilization responds creatively to history's challenges, it can turn crisis into growth. The creative response may also demand a return to the nation's original conception or vision, but not for the sake of recapturing it as it once was. As the French say, il faut reculer pour mieux sauter en avant (one must back up in order to leap forward). Re-visioning or renaissance of a nation’s vision can provide that nation with the morale and motivation to regenerate itself. In times of crisis there is a tendency to react with piecemeal solutions—such as economic initiatives—that deal with the nation's problems in a mechanistic, nuts-and-bolts manner. But what is often missing is a larger, unifying vision that connects these solutions to an overarching purpose. A clear vision that is invigorated—or reinvigorated—with the purpose of transformation may not always be a wrench for the nuts and bolts of the nation's problems, but is still a most valuable and practical asset. It may mean the difference between survival and extinction. How well the filmmaker Federico Fellini understood the practical value of visionary thinking when he said, "The visionary is the only true realist." The United States today is in a remarkably similar position to that of the ancient kingdom of Judah in the time of Nehemiah and Ezra. Like Judah of old, contemporary America is at a critical historical junction, a crossroads with two possibilities. It might continue on its present course. To what end its outdated heroic ideal and addictions to height and innocence will lead, only time will tell. Conceivably, the current diffusion of the American vision could lead to its complete derailment and the eventual disintegration of American society. History has shown that this is what happened when other great nations failed to keep their visions alive or failed to live up to them. As Voegelin, Strauss, and others have noted, a society that has been accustomed to understanding itself in terms of a universal purpose cannot lose its orientation toward that purpose without, naturally, becoming seriously disoriented. For example, Rome was a great republic until its vision of republicanism became thoroughly derailed with the civil wars that concluded in 27 B.C.E. Though the empire emerged and Rome basked in glory and prosperity for another 400 years, the tyranny that replaced this republican vision was sooner or later bound to lead to Rome's demise. Will America, with its different type of empire and a different kind of tyranny, follow in Rome's footsteps? The second choice America has is to attempt what Judah accomplished: namely, a spiritual revitalization and deepening of its vision. Of course, this would take a very different form for America than it did for Judah. Although their visions share certain key elements due to a common religious tradition, the two nations represent very different societies existing in very different eras. Nevertheless, as was the case with Judah, America would need to take its vision to another level, one in which it is integrated into the daily lives of the people. It would need to seize its vision with a fresh understanding that would equip it to face its problems and its fate. Most certainly, vision is about fate, about meeting an inner calling. "In everything that matters," the writer G. K. Chesterton said, "the inside is much larger than the outside." It seems that contemporary America is completely dissociated from the inside—the spiritual side or calling—of its vision. As long as the American vision continues to be lauded in history books, news magazines and political speeches without any sense of its inner meaning, that meaning will never become a living truth in the minds and hearts of the people and the practical affairs of society. The vision of a free people spearheading an empire of liberty leads to a number of difficult if interesting problems. It is an idea that has consistency only when freedom is understood as an expression of personal integrity. Any other understanding of freedom tends to lead to a kind of freedom that in the long run is good neither for the individual nor for society. From its Puritan beginnings, the American vision was about integrity—moral integrity and the integrity of good, balanced living. As the Puritans saw it, America's special calling was to become a righteous nation, a land where nationhood and virtue were to be combined. In a world corrupted by ecclesiastical politics, monarchies, and other sordid forms of tyranny and human vice, this was a rather novel idea. It presumed that every individual in the nation must attain a moral probity that is genuinely free. Ideally, such morality would not be imposed forcefully from outside by some social authority, but would be an expression of individual integrity and conscience. This kind of morality or virtue is what the early Puritan founders were thinking of when they envisioned America as a "nation of saints." That moral authority should rest within the individual is a principle that can be traced back from the Puritans to Martin Luther and earlier. (Of course, with their own ecclesiastical politics, the Puritans didn't always practice this principle purely either.) Luther's teaching that we are all our own priests with our own relationship to God was a building block of American democracy. By honoring the individual, it advocated our right to govern ourselves. It held the view that the individual holds the key to what is common ethical sense, not the collectivity. It also goes without saying that the establishment of this kind of freedom in America—a freedom of the spiritual and not just political realm—was to be the fulfillment of the Protestant Reformation. Almost every Puritan tract expressed the view that the Reformation had reached its final culmination in America. The Founding Fathers had their own version of this moral venture. The Scottish philosopher Francis Hutcheson had a strong influence upon Jefferson. His idea of the moral sense or faculty innate to all human beings was seen by Jefferson as a guarantee that Americans, once freed from the institutional shackles that weighed down Europeans, could develop their energies fully while still being moral citizens. In fact, it was largely because of this idea that Jefferson was so confident in his belief that the less government interfered in citizens' affairs, the better. Jefferson's enduring trust in what he called "the will of the people" rested on this idea. The will of the public was essentially benign and would not behave despotically because democracy, having eliminated the corrupting institutions of monarchy, would allow people to act freely in accord with their moral instincts. introspection, or what we would call psychology. . . .
political theory, Adams is the master psychologist. in his heart and kept preaching to himself in his diary. lessons learned in dealing with one's own internal demons. exterior rewards that the mastery of appearances could bring. not just means to an end for him, but the ends themselves. . . .
regarded political analysis as a public version of introspection. To Adams, integrity was not a state of purity acquired through having permanently exorcised one's demons; he did not believe, given human nature, that this was possible. Rather, integrity was characterized by an honest effort to confront one's demons and at least keep them plainly in view and under a modicum of control. The control came more from understanding them than from dominating them. Similarly, freedom did not necessarily come from being free of them, but from knowing that they existed and making wise decisions on how to act. Thus did he believe in the importance of introspection as the basis for action, including public action. Adams was not a moralist; he did not adhere to a prescribed system of right and wrong conduct and did not seek to impose his personal morals on others. Though perhaps conservative, he was unlike the advocates of virtue so popular in America today, such as William Bennett, who with his politically partisan and aggressive moralism has been fittingly described by author James Hillman as a "thug of virtue." The ethical sensibility of Adams was much more willing, in matters demanding moral consideration, to openly question which actions would be helpful, which harmful, and which simply meaningless. Though his most inviolable ethical principle was at heart Christian—"Do unto others as you would have them do unto you"—his was largely an ethics of common sense. John Beebe has described this kind of integrity as "a commitment to serving the process as a whole." It is wholesome not because it has attained purity but because it acknowledges and is willing to struggle with that which is impure but unavoidably part of the picture—one's vulnerabilities, flaws, demons and evil propensities. It aims to own and understand these dark realities within oneself before focusing on them in others. The psychologist Erich Neumann referred to this kind of integrity as a new ethic of wholeness replacing the old ethic of perfection that has prevailed throughout most of Western history. Writing shortly after the end of World War II, Neumann concluded that "The old ethic of the Judeo-Christian epoch has proved itself incapable of mastering the destructive forces in man. . . . The new ethic is based on an attempt to become conscious of both the positive and the negative forces in the human organism and to relate these forces consciously to the life of the individual and the community." Similar to Adams' approach to integrity, "the individual must work through his own basic moral problem before he is in a position to play a responsible part in the collective." The great difference between Adams' ethic and the new ethic of which Neumann speaks is that the latter is rooted in modern psychology. It understands the problem of objectivity that arises when the object of introspection is the same as the instrument—the psyche—and it recognizes the existence of an autonomous, unconscious part of the psyche that, by its very nature, changes the parameters of discussion about things dark and evil. It is true that thinkers like Jefferson and Adams knew the unconscious as the secretive will and pleasures of the heart, and they knew of its depth and passions and could poetically speak of these in the language of the heart. And it is true that they were writing and thinking at the beginning of the psychological age, whose dawn was the Enlightenment. After all, Jefferson and Adams were contemporaries of Kant. The investigation of the psyche or mind was not unheard of. Nevertheless, because their ways of introspection predated Freud, Adler, and Jung, their gaze inward saw different things or saw the same things we do but very differently. It is curious how much of Jefferson's personality was imprinted upon the American vision and how little of Adams', especially in view of the fact that in their day they were considered equally important fathers of the American Revolution. Adams was a classical political theorist and strangely out of sync with the modern political theory of republicanism that had come to play a central role for leaders such as Jefferson and Madison. And he was simply not as inspiring a figure as Jefferson. Yet it would be interesting to fantasize how Adams' outlook and the introspection and ethic it was based on might have influenced the American vision—indeed, American history as a whole—had his impact been different. In going back to a nation's original vision in order to reconceive or re-vision it, it is helpful to sift through all its original possibilities and its less well-known strands, especially those that are introspective and thus more intimately entwined with the vision’s inner core. As the Chinese sage and founder of Taoism, Lao-tzu, said, "Let your wheels move only along old ruts." Historians have only recently begun to reclaim Adams' importance both as a thinker and an actor on the stage of events. The polarity of spirits that runs through American history, including the unfolding of the national vision, reaches a uniquely balanced equilibrium in the political thought of John Adams. His sagacity fell somewhere between the pessimism and strict moral calculus of the Puritans and the idealism of Jefferson. The Puritan vision was a vehicle of authority steered by a rare sense of youth. The vision of the Founding Fathers, by contrast, was a vehicle of youth steered by the common sense of authority. Among the Founding Fathers, John Adams' voice was the one that most resounded with the call for common sense. In hindsight, it is evident that Adams' particular gift of common sense did not steer the revolutionary vision nearly enough on matters where it may have been of benefit. Adams' vision for America is conspicuously devoid of the innocent assumptions that colored Jefferson's and that, among other things, provided a charter for the cults of novelty, freedom, and happiness. Adams did not believe that Americans had special access to the moral faculty or that they were an elevated people simply because they broke from Europe. He did not believe in the unfaltering benevolence of "the will of the people." Nor did he believe that America had a mandate rooted in Divine Providence; in his view, God's grace would render Americans immune from the ravages of history no more readily than it would other people. Adams did not believe that all people are born equal, or that social equality could ever be attained; if anything, as Tocqueville later argued and as history corroborated, freedom enhances the unequal distribution of property. He did believe that all people are born with equal rights, but that was a different matter and what he as a revolutionary took from John Locke's creed. He furthermore did not believe, as did Jefferson, in an ideology of individual liberation from all forms of exterior constraint or control (at least not until humankind had mastered a sense of interior integrity obviating its need for such constraint or control). Adams did not believe in slavery, or in states' rights to decide upon whether or not to permit slavery; unlike Washington, Jefferson, and Madison, he owned no slaves. And, curiously for one who in his day was considered conservative but today would be viewed as liberal, he believed that responsible government could not be divorced from the dynamics of society or the marketplace; government is an inherently collective enterprise whose goals must transcend the ambitions and ethos of mere individualism. Whereas for Jefferson the promise of American life was a birthright of personal fulfillment unimpeded by government, for Adams it was a legacy of public commitment made possible by government. has passed and not yet come again. Who knows? Perhaps the pendulum of history has already begun to swing back toward Adams. Recent times have witnessed a small Adams revival, starting in the 1950s with the publication of The Adams Papers (400,000 items from Adams' letters and diaries). When in 1976 the historian Robert Rutland reviewed the several modern editions of the papers of the Founding Fathers, he found there a fresh scholarly consensus: "Madison was the great intellectual . . . Jefferson the . . . unquenchable idealist, and Franklin the most charming and versatile genius, but Adams is the most captivating founding father on most counts." Most recently David McCullough’s bestselling John Adams, which was also made into a television film, confirmed that. Within the liberal, republican tradition they commonly shared, Jefferson and Adams played out a youth-authority dynamic with each other no less than the two together represented the spirit of youth revolting against the authority of the old order. They played out this dynamic philosophically and in other ways too; Adams even described the young Jefferson who served with him in the Continental Congress as having been "but a boy to me. . . . I am bold to say I was his preceptor in politicks and taught him everything that has been good and solid in his whole political conduct." But the youth and authority principles are historically reciprocal, and as authority gives rise to youth, so too youth turns to and into authority. Indeed, Adams' day may yet lie ahead. The idea of freedom as an expression of interior integrity is the only one that is consistently good for the person and for society because, short of that, freedom is neither qualitatively complete nor about psychological wholeness. Two hundred years of American democracy have shown that there is a great difference between the Jeffersonian freedom of the individual and a more comprehensive freedom of the person. Whereas the former is a purely social condition—the individual is free relative to whatever restrictions society imposes upon him or her—the freedom of the person is a spiritual condition limited only by the degree of one’s interior integrity. The Jeffersonian idea of freedom is essentially negative, defined by what it is not. It is freedom from encroachments by church or state, freedom for the individual to be left alone to pursue happiness. Indeed, it is essentially the freedom to be an individual, a self-contained identity responsible only to itself. But is this really freedom or identity, especially when our mass-minded consumer culture is so intent upon creating the exact same individual—the exact same ephemeral self, as Toynbee would say—out of millions of people? Liberal democracy combined with modernity has given rise to a conformist mentality in the guise of freedom, a totalitarianism that is especially dangerous because of its seductive appearance. Tocqueville was right. With all its so-called freedom, America has not been able to generate a society that, through its public discourse and the education of its citizenry, can even recognize much less free itself from the tyrannical addictions that grip it. Genuine freedom encompasses much more than what Americans mean by "democracy." The freedom of the person grounds the freedom of the individual in the dimension of character and ethics. Because it is concerned with the person's integrity—with what kind of person he or she is, with the richness of values he or she expresses in connection to others and to life as a whole—it is not negativistic. It involves not merely a declaration of human rights but, Nikolai Berdyaev tells us, a declaration of the human's obligation or duty to display the strength of his or her personal character. Rather than reveling in an ephemeral self, it reveals a self of substance and purpose. This kind of freedom is the only possible positive alternative to the negativistic freedom of the individual that now prevails in America. It alone provides a viable response to the addictions to height and innocence and to modernity's mechanized, atomized individuals and their cog-in-the-wheel mentality. To quote Thomas Merton, "The person must be rescued from the individual." Democracy needs to evolve to the personalistic level of freedom if it is to resolve the problems it has created at the current individualistic level. Indeed, if Einstein is correct, the problems created at any given level of thinking or being can be resolved only from the vantage point of the next higher level. The freedom of the person, as both Adams and Jefferson knew, is not something that can be instilled by government institutions and political philosophy. It is an expression of integrity that must exist at the core of government institutions and political philosophy. Without it, democracy can be easily thwarted and lose its meaning. In other words, freedom is something even greater than democracy. Men and women who were inwardly free have lived in all kinds of societies, even tyrannies. Their freedom was not dependent on democracy, yet democracy, in order to promote a society that possesses a deep integrity, is dependent on the freedom of the person. The freedom of personhood is a theme of many great novels, such as Arthur Koestler's Darkness at Noon and Dostoevsky's The Brothers Karamazov, the latter of which very much influenced Berdyaev's seminal work on this subject, Slavery and Freedom. The notion of a free people spearheading an empire of liberty acquires a different meaning when thought of in terms of this kind of freedom. I doubt that any reframing of the American vision that does not address this kind of freedom could make a significant contribution toward the advancement of American civilization, given the current problems with which it is beset. cannot but actively enter into society and history. In other words, we are both spiritual and worldly, and the two dimensions are experienced as opposites. The Christian mystics attempt to resolve this problem—the "problem of objectivization"—with their teaching that one should aim to be in the world but not of it. Similarly, the Buddhists teach that one should be in the world and should even be at one with the world, but should be detached from desire for its objects and pleasures. Adams’s way of dealing with this problem was by self-denial, that is, by denying himself satisfactions that would jeopardize his integrity (e.g., the satisfaction of being adulated, something from which he himself admitted he suffered). The opposition between personal freedom and social, historical processes makes the possibility of personal freedom finding a "home" in democracy about as likely as its finding one in any other collective form. Personhood, Berdyaev insists, "transfers the centre of gravity of personality from the value of objective communities—society, nation, state—to the value of [subjective] personality." Although personhood "presupposes a going out from self to another and to others" and "cannot but have some sort of community in view," the moment it becomes collectivized in some rigid form--such as a national program--and sacrifices its unique quality of being a living experience among persons, it turns into an objectivized "thing" and loses its freedom and integrity. It is taken out of the spiritual realm and loses its spirit. This is not to say that large social bodies cannot, hypothetically, become sensitive to the needs of personhood. Merely, those needs cannot be met by a broad-brush approach to reform on the collective level of those bodies, by some sort of "New Deal." They must be met by each person. The only kind of community and democracy that can serve personhood are those that resist the slavery of collectivization and nourish the spiritual and ethical development of the person. sharp as the edge of a razor. For this reason, the reconceptualization of the American vision is concerned with a problem of the human condition on the largest scale and in the profoundest sense. It is fair to say that if America were to resolve this problem it would resolve a central problem of history itself, of why civilizations ultimately disintegrate or collapse. Adams and Jefferson alike were pessimistic about the question of America's longevity. They thought, as was standard for students of history in their day, that the United States would go the way of other nation-states and civilizations. This was the law of history: All nations have a natural, limited lifespan. Much as an individual, they develop their energies and talents in youth, reach their maturity and high point in midlife, then decline into old age, and sooner or later pass away. The reason for this decline into extinction is that they become corrupted by their worldly successes, so that, sapped of their earlier energy and work habits, they descend into depravity. "Former ages have never discovered any remedy against the universal gangrene of avarice," Adams wrote, "and the steady advance of Wealth . . . has overturned every Republic from the beginning of time." Of course, Toynbee and others have shown that it is more complex than this, but the general premise is correct: that adhering to or indulging in past adaptations in the face of new challenges results in disintegration or collapse. The difference between the views of the Founding Fathers and modern historians is only in relation to the nature of the law behind the rise and fall of civilizations. It is correct that civilizations fall when they lose their integrity. Then, as Toynbee illustrated, they disintegrate. But Toynbee also made it clear that a timely creative response can alter the course of history, that there is no fixed law for the decline and demise of civilizations as there is for individuals. As McLuhan later said in regard to this matter, "There is absolutely no inevitability as long as there is a willingness to contemplate what is happening." To state it another way, if freedom speaks to the recognition of necessity, as Garrett Hardin wrote, then survival speaks to the necessity of recognition. But even without a fixed law of termination, the pessimism of Adams and Jefferson is still well justified. There has yet to be a republic that did not eventually lose its integrity, that is, disintegrate. The hope that the United States can survive long enough to permit the development of the personalistic freedom and integrity needed to catapult its republic as a whole to this next level of freedom, can only be met with pessimism among those familiar with history. As Jung stated, humankind simply has not yet evolved to that level. And yet, curiously, the necessity to evolve there seems to be the fateful and imminent challenge facing America. One wonders, will the United States become a fossilized dinosaur along with the other extinct nations of the earth, or will necessity, the mother of invention, compel it to adapt and evolve successfully? Given that a number of prominent thinkers have imagined this challenge itself to be the next great "leap in being" that humanity must take, one wonders whether the forces of history and evolution, in having brought the leading nation of Western civilization and the world to this precipice, have not conspired to somehow merge together the destinies of all three--nation, civilization, and world. It seems as if history's challenge to America to graduate from its childhood is identical to the challenge facing mankind to graduate from its childhood; these challenges are, in essence, one and the same. As Edward Edinger remarked, "America is a great experiment in which the ability of the world to survive is foreshadowed. With all the ethnic groups in this nation, and the human conflicts these bring, we are not only a melting pot, but a microcosm of the world. If we fail to 'make it work' here, it does not bode well for the rest of the world, itself so divided." If it is indeed America's fate or calling to be at the leading edge of humanity in taking this next evolutionary leap of consciousness, then the vision of the Founding Fathers will have presaged it in a way that even they could not have foreseen; their vision would have been prescient in spite of its innocent assumptions. They spoke of a New Order of the Ages--Novus Ordo Seclorum—but, as discussed earlier, what they had in mind was a new social order based upon democracy. Their greatest hope was that democracy would spread throughout the world, creating the empire of liberty of which Jefferson spoke. Breaking with the old order of monarchies and oligarchies, humankind would finally, on a global scale, have representative governments in which citizens would rule themselves and as free agents. This was not an idea of a single world government; the greatest expanse that the Founding Fathers hoped America might directly subjugate was the Western hemisphere, and even annexing more than Canada—that is, extending the United States into South America—was in large part only a Hamiltonian fantasy. One could say, however, that this was an idea of "world Americanism," meaning that the model of America would become a world phenomenon, with the world looking to America as its authoritative guide and leader. The innocence of this idea lay in the assumption that its actualization would really introduce a new order of the ages, a condition for humankind that would constitute a radical break from the past. True, democracy has liberated people in the social, economic, and political spheres—an accomplishment not to be minimized. But as Tocqueville already knew in the mid-nineteenth century, democracy would not significantly change the condition of human consciousness and the inner quality of life; in some key respects it would even lead to their deterioration. The liberties of American life would create new confusions that would tend to make its citizens less free rather than more. As Erik Erikson reflected in the mid-twentieth century, "The American feels so rich in his opportunities for free expression that he often no longer knows what it is he is free from. Neither does he know where he is not free." Another innocent notion is that a radical break from the past in international affairs would result from the new world order or global Americanism created by democracy. In fact, as former Secretary of State James Baker said, this new world order is already evolving and can be observed in the rapidly increasing democratization of the world. But relations between the nations of the world are not all that different than they were a hundred years ago. Nations are as nationalistic and conflict-oriented as they ever were, if not more so. McLuhan and Fiore observed that nationalism, involving a heightened awareness of separate tribal identities and geographical boundaries, is a pre-twentieth-century level of consciousness that has not yet caught up to the contemporary consciousness of the global village. But it thrives, and in fact, with the fall of the British and Soviet empires, has even increased: there are currently 193 nation-states in the world in contrast to 72 in 1946. This proliferation of nations and nationalism naturally generates wars. As C. Wright Mills wrote, only a decade after the end of the Second World War, "All over the world, the warlord is returning. All over the world, reality is defined in his terms." The Marxist influence on his views may have led him to misconstrue the reasons for this, but he accurately identified the trend. Indeed, the number of wars being waged at any given time has greatly escalated. There were 64 armed conflicts in the first half of the twentieth century compared to over 100 in just its last decade (though needless to say the mortality due to war in the first half of the century far surpassed that of the latter half). Terrorism has also dramatically increased. The democratization of the world promoted by the United States and accelerated by the collapse of the Soviet Union has thus far done little to assuage the trend of nationalism. By allowing ethnic groups formerly without their own states the option of self-determination, the spread of democracy has even made the impulse toward nationalism more realizable. Balkanization has increased too as independence movements have divided nations into small, quarrelsome, ineffectual states. As the Israeli leader Shimon Peres remarked, the current trend of the world is toward global cooperation in economic affairs and nationalism in political affairs; we may therefore need two solutions—two models—to deal with the relations between nations. In short, humanity is still operating according to its childhood model of international relations, and the democratization of the world, though still in progress, has had little positive effect upon this. A New Order of the Ages as envisioned by the Founding Fathers has thus largely come about, and what has not yet come about can be anticipated based upon what has. The New Order of the Ages is not so new after all. But what the historian Thomas Kuhn revealed about the process of scientific innovation may be said about other areas of innovation too: It is common that a new model or paradigm that explains something heretofore unknown is, at first, but a "promise of success." Visionary though it may be, it is almost always incomplete and rudimentary initially, a preliminary glimpse of what could be. A new paradigm isn't born as a fait accompli. It needs to be tested over time, and as this is done, its details are fleshed out and the paradigm is more fully articulated. As anomalies emerge, the paradigm must be adjusted in order to continue to be explanatory. Some established beliefs are discarded, some new ones adopted. If the anomalies are profound enough to begin limiting the paradigm’s effectiveness, the search to resolve them may lead to the birth of another new paradigm. That such a process might need to occur with the American vision was not altogether beyond the imagination of the Founding Fathers. Jefferson called for periodic revolutions, and Adams, in contemplating the spiraling nature of history, speculated that America might only be a single turn in the age-old, recurring pattern of rise and fall that moves the human condition ahead a few notches with each cycle. Indeed, perhaps the American vision would not even be actualized by the United States, but by some descendent or beneficiary further down the road of history. Certainly, if the inner, core meaning of the American vision—the only dimension of meaning that has yet to be realized and that would have any real significance in today's world—points to a revolution in consciousness such as described above, then we are speaking about a very dramatic leap in the human condition. A revolution in which the freedom and integrity of the person would become the ruling principles of society would be a new order of the ages resembling only one other such new order in recorded history. That one was not just a major event in the world of public affairs—that is, in the polis or society—but in the scheme of human evolution. Voegelin, one among numerous historians and philosophers writing about this development, refers to it as the periagoge, a Platonic term that means "conversion" or "turning around." It represented a radical shift in human consciousness, a reorientation of how humana experienced themselves in relation to the universe. Although it primarily involved a redefinition of the nature of religious experience, it was inherently also a redefinition of the nature of human freedom, thus lending weight to Hegel’s famous observation that “the history of the world is none other than the progress of the consciousness of freedom.” It occurred in the context of religious experience because this was (and one may argue, continues to be) the stage upon which the search for freedom takes place in its most profound sense. The periagoge was, indeed, a religious conversion. For millennia humanity had believed in the divine as cosmic forces "out there"—animal-gods, planets, or nature (the sun, moon, earth, wind, ocean, etc.). With this dramatic change in consciousness, humanity now believed in the divine as Something transcendent or beyond the worldly, no longer just "out there" and certainly not out there in limited, fixed forms, but also "in there," within the psyche or soul. In fact, the psyche itself had been discovered; the human soul, formerly a rather compact structure, was now differentiated or opened up, so that it became a new center through which the divine could be experienced. This was one of the most momentous events in the history of consciousness. The discovery of divinity's ultimate transcendence and of the psyche as the instrument for experiencing this transcendence not only had profound spiritual and psychological implications, but social ones too. The measure of what was important in and for society became no longer the human being or the divine in its old, cosmological sense, but the human being as the representative of divine truth. Humanity and society became the vehicle for the divine, a connection that came to be symbolized in the idea of "the city," be it the city of God, the heavenly city on earth, the city on a hill. The historical expressions of this idea were, of course, Jerusalem, Athens, and Rome. This idea resurfaced in the American vision: America was to become the new heavenly city on earth. One can even argue that the American vision is a re-visioning of this same aspect of the original periagoge. Indeed, the American vision offers its own distinct rendition of the idea of the heavenly city. As the psychologist Marvin Spiegelman has pointed out, the extraversion of the American psyche predisposes it to seek "God among us" rather than "God within us" (as is the orientation, for example, in India). Thus, what stands out in the American vision is its ultimate goal of the spiritual brotherhood of man. This brings us back to our original premise: the re-visioning of the American vision implies a return to, and yet a new understanding of, that goal. The spiritual brotherhood of man can happen only if enough persons are related to each other with inner freedom and integrity to make a widespread, social difference. If the periagoge marked the transition from outer-directed to inner-directed religious experience, then the American vision marks the hypothetical transition of the latter from being a privilege for the few to a priority for the many. Providence here might genuinely avail itself to many because it is, as theologians agree, a phenomenon most inclined to become evident in the personal realm; it is through their personal freedom and integrity that many might now indeed discover the mysterious will and workings of God. And what could more manifest the will and workings of God in the world than the spiritual brotherhood of man? Understood in this way, the American vision of the brotherhood of man, if ever realized, would be as great a transformation of consciousness as the periagoge. It would genuinely introduce a New Order of the Ages, but not the kind that is limited to or dependent upon a social or collectivistic world order; this new order, although certainly expressing itself socially, would be what Voegelin would describe as a new order of being. Such a transformation of consciousness has been, in one aspect or another, a subject of interest for a number of thinkers, among them Toynbee, Jung, Neumann, Karl Jaspers, Lewis Mumford, Teilhard de Chardin, F. S. C. Northrop, Berdyaev, McLuhan, Julian Huxley, Pitirim Sorokin, and Sarvepalli Radhakrishnan. Some of these thinkers even see this transformation as a natural and teleological development driven by the principles of evolution; to them it only makes sense that we should evolve into a more ethically differentiated and conscious creatures. However, even if such a transformation is bound to occur, it would, in all probability, be too far off on the event-horizon of history to speak about in any but the vaguest terms. But, in the final analysis, it is not necessary to speak about it at all. The crucial ingredient of this transformation, whether it occurs tomorrow or a thousand years from now, is each person's ethical and conscious self-examination. If each person attends to this, the rest should take care of itself. Even social movements or organized collective efforts in which people join together to improve society would have a different impact because they would be undergirded by personal introspection. About this, there is nothing vague. It is, after all, a basic premise of democracy as well. Jefferson and Adams knew well that an enlightened citizenry depends upon the ongoing ethical and conscious self-examination of its individual members. In 1998, Pizza Hut filed a lawsuit in federal court against Papa John's in what was to become a protracted and heated series of conflicts between the two chains. Pizza Hut charged Papa John's with unfair competition and deceptive advertising—in particular, a television commercial in which Papa John’s boasted that it had better pizza and used better ingredients than Pizza Hut. The commercial featured one of the founders of Pizza Hut touting his new role as a Papa John's franchisee and explaining that he liked Papa John's pizza so much that he had decided to come over and join Papa John's. Shortly after, Pizza Hut retaliated with its own commercials attacking Papa John's, and the latter filed a countersuit. What is interesting about this episode—and it is just one illustration of American business in action—is the intensity of emotion that fueled it and the spiritual principles that were enlisted to give it an aura of importance. In television interviews, the CEOs of both corporations made it very clear what the legal case was about. It was not just about pizza. Nor was it just about money and profits. It was about truth. Asked what this truth was, both CEOs said it was about better pizza. This was not a game the two companies were playing, the CEO of Papa John's passionately argued. It was war. Indeed, listening to them one would think that they were two generals defending the very existence of their nations. Moreover, one could hear a visionary zeal in the tremor of their voices, as if they were not only Founding Fathers protecting their child-visions but prophets with a message of profound inner truth and significance. This episode shows, on the one hand, how far America has digressed from its vision and, on the other, paradoxically, that it can never digress very far at all. Such an episode would not likely occur in a nation like Belgium, for example, where there is no deeply ingrained, national messianic vision. Such visionary zeal would appear absolutely ridiculous and out of place there, not only because it is attached to pizza and profits, but because there is simply no psychological and cultural context for it. In America, people know about visionary ambition; it is ingrained in the American psyche. The American vision is part and parcel of the American character and collective unconscious. And even if the vision has become diffused in the American culture so that people no longer recognize it, it surfaces wherever ambitions can merge together and one ambition can become the cloak for another. That is why this episode illustrates how far America has digressed from its original vision, and yet how it can never digress very far at all. Johnson's vision was derailed, among other things, by the race riots of the 1960s and the debilitating effects of the Vietnam War, but he had the right idea. It was based, like the vision of the Founding Fathers, on the great society or the noble city that the Athenians and Romans built at the height of their civilizations. But unfortunately, a look backwards was all that this idea could amount to; it was and is still not substantially rooted in contemporary American society. The American vision remains just that: a vision. Johnson's words today sound like ancient echoes in the deserted streets of a city that the American has yet to inhabit. We are now beginning what is already being hailed as the second American century. Such centuries are only fleeting moments in the infinite expanse of time, but for a nation, they are important. We need to decide: How do we want to be remembered in the historic journey that, if Toynbee and others are correct, will advance humanity to a more evolved level of consciousness? We need to decide: Will we protect and deepen our democracy in order to help us—and perhaps the world—arrive at that level of consciousness, or will we continue to let it be eaten away from the inside by the many things that threaten it? Indeed, it is our duty to respond to this challenge creatively. At present, it is not clear whether we will wake up and seize this challenge as best we can, or remain unconscious. Our fate sleeps as we do, and at least for now, waits. 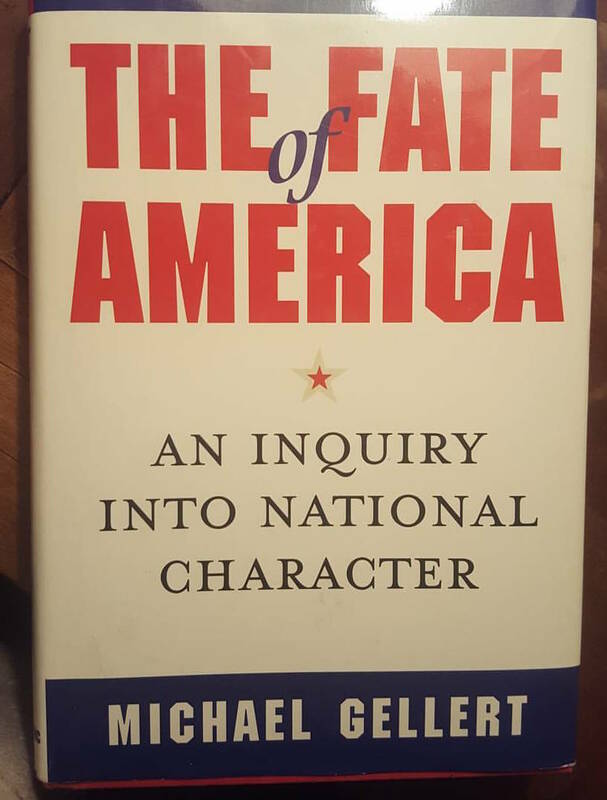 MICHAEL GELLERT is the author of "The Fate of America," "Modern Mysticism," "The Way of the Small," and, forthcoming in 2018, "The Divine Mind: Exploring the Psychological History of God’s Inner Journey." He lectures widely on psychology, religion, and contemporary culture. Michael was educated in rabbinic Judaism, studied theology at Loyola College in Montreal, and trained with the renowned Zen master Koun Yamada in Japan for two years. He also studied with Marshall McLuhan at the University of Toronto. A Jungian analyst, he was formerly Director of Training at the C. G. Jung Institute of Los Angeles, where he is currently a research instructor. A society that has been accustomed to understanding itself in terms of a universal purpose cannot lose its orientation toward that purpose without, naturally, becoming seriously disoriented. Jefferson's idea of the moral sense or faculty innate to all human beings was seen by Jefferson as a guarantee that Americans, once freed from the institutional shackles that weighed down Europeans, could develop their energies fully while still being moral citizens. Personal integrity is the bridge that connects the psychological freedom attained by the individual with the democratic freedom of society. It is the inner integrity and freedom of the individual that serve as the cornerstone of the freedom of society. As long as the American vision continues to be lauded in history books, news magazines and political speeches without any sense of its inner meaning, that meaning will never become a living truth in the minds and hearts of the people and the practical affairs of society. Conceivably, the current diffusion of the American vision could lead to its complete derailment and the eventual disintegration of American society. For Adams, integrity was not given to humankind as a natural disposition, but had to be earned the hard way. Integrity was characterized by an honest effort to confront one's demons and at least keep them plainly in view and under a modicum of control. The control came more from understanding them than from dominating them. Liberal democracy combined with modernity has given rise to a conformist mentality in the guise of freedom, a totalitarianism that is especially dangerous because of its seductive appearance.